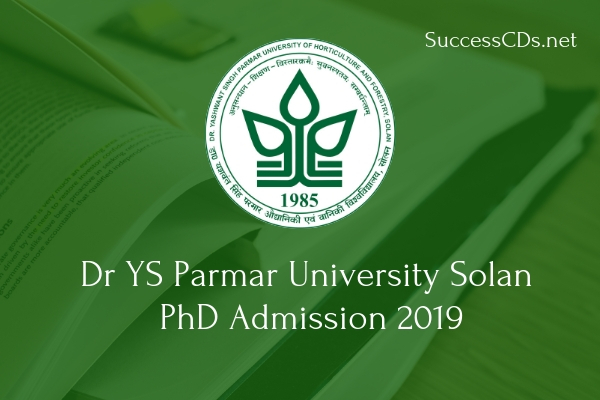 Interested candidates can check all the details of Dr YS Parmar University PhD Admission 2019 like application form, eligibility criteria, procedure etc. from this page give below. M.Sc. degree in concerned discipline with research thesis submitted in partial fulfilment of the program in the concerned discipline from a recognized University under ICAR-AIJ system of education with an OGPA of 6.50/10 (65% marks). M.Sc. degree in Food Technology/ Food Science & Technology with research thesis submitted in partial fulfilment of the program in the concerned discipline from a recognized University under ICAR-AU system of education with an OGPA of 6.50/10 (65% marks). M Tech degree in Food Technology holders with research thesis submitted in partial fulfilment of the program and an OGPA of 6.50/10 (65 % marks). M.Sc. degree in concerned discipline with research thesis submitted in partial fulfilment of the program in the concerned discipline from a recognized University under ICAR-AU system of education with an OCJPA of 6.50/10 (65% marks). For the disciplines of Forest Genetic Resources. Silviculture, Agroforestry, Wood Science & Technology, Medicinal & Aromatic Plants, Natural Resource Economics; first priority shall be given to the candidates having specialization in the same discipline. However, if any seat remains vacant in any of these disciplines, the candidates from across other disciplines within the group viz., Forest Genetic Resources, Silviculture, Agroforestry, Wood Science & Technology, Medicinal & Aromatic Plants, Plantation Technology and Watershed Management shall also be considered on merit basis. Agroforestry, the candidates with M Sc Horticulture/ Agriculture/ Animal Science with research thesis submitted in partial fulfilment of the program in the concerned discipline from a recognized University under ICAR-AU system of education with an OGPA of 6.50/10 (65% marks)/ candidates with,AIFC diploma will also be eligible. MSc degree in Soil Science with research thesis submitted in partial fulfilment of the program in the concerned discipline from a recognized University under ICAR-AU system of education with an OGPA of 6.50/10 (65% marks). However, if any seat remains vacant, the candidates with MSc (Forestry) Watershed Management shall be considered on merit basis. MSc degree in Agricultural Economics/ Economics with research thesis submitted in partial fulfilment of the program in the concerned discipline from a recognized University under ICAR-AU system with an OGPA of 6.50/10 (65% marks). M Phil degree in Agricultural Economics/ Economics from a recognized University under UGC system of education with 65% marks. The candidate must have also secured 65% marks at MSc level. MSc degree in Entomology/ Nematology with research thesis submitted in partial fulfilment of the program in the concerned discipline from a recognized University under ICAR-AU system of education with an OGPA of 6.50/10 (65 0/0 marks). M Phil degree in Entomology/ Zoology from a recognized University under UGC system of education with 65% marks. The candidate must have also secured 65% marks at MSc level. MSc degree in Plant Pathology/ Mycology & Plant Pathology with research thesis submitted in partial fulfilment of the program in the concerned discipline from a recognized University under ICAR-AU system of education with a GPA of 6.50/10 (65% marks). M Phil degree in Plant Pathology/ Botany from a recognized University under UGC system of education with 65% marks. The candidate must have obtained 65% marks at MSc level. MSc degree in Molecular Biology & Biotechnology/ Biotechnology with research thesis submitted in partial fulfilment of the program in the concerned discipline from a recognized University under ICAR-AU system of education with an OGPA of 6.50/10 (65% marks). M Phil degree in Molecular Biology & Biotechnology/ Biotechnology from a recognized University under UGC system of education with 65% marks. The candidate must have also secured 65% marks at MSc level. M Tech degree in Molecular Biology & Biotechnology holders with research thesis submitted in partial fulfilment of the program and an OGPA of 6.50/10 (65 % marks). MSc degree in Microbiology with research thesis submitted in partial fulfilment of the program in the concerned discipline from a recognized University under ICARAU system of education with an OGPA of 6.50/10 (65% marks). M Phil degree in Microbiology from a recognized University under UGC system of education with 65% marks. The candidate must have obtained at least 65% marks at MSc level. MSc (Forestry) Environmental Management or MSc Environmental Science with thesis in partial fulfilment of the program from recognized University under ICARAU system of education with an OGPA of 6.50/10 (65% marks). MSc Forestry/ Horticulture/ Agriculture and its allied disciplines with thesis in partial fulfilment of the program from recognized University under ICAR-AU system of education with an OGPA of 6.50/10 (65% marks). M Phil degree in Bio-Sciences/ Physical Sciences from a recognized University' under UGC system of education with 65% marks. The candidate must have also secured 65 0/0 marks at M Sc level. In-service candidates with MSc degree from ICAR/ State/ Central Institutes including Associate of IGFNA with diploma equivalent to MSc Forestry with an OGPA of 6.50/10 (65 0/0 marks). For such candidates having at least 3 years research/ teaching experience, the requirement of thesis in partial fulfilment at MSc shall be relaxed. Last Date for submission of online application is 03rd January 2019 without late fee and 08th January 2019 with a late fee of Rs.1000/-. No documents in person shall be accepted. For any clarification with regard to admission, please contact Academic Section, Office of the Registrar of the University on any working day from 10.00 AM - 05.00 PM on am 792-252009.